Isabel Fletcher in Editor's Picks Science & Technology on 14 February, 2017. The number of people cutting gluten from their diet far exceeds the 1% of the UK population that suffers from celiac disease and gluten intolerance. So why are people actively choosing to cut out such an array of products? Going gluten free even if you are tolerant to it may stem from the idea of ‘clean eating’. This social media trend was kickstarted by food bloggers posting pictures, followed by recipes, of food that they were eating. The original idea of clean eating was to focus on reducing the amount of processed food consumed and cook healthy meals centred around fruit, vegetables and whole grains. However, this is all changing. There is increasing concern that the need to eat ‘trendy’ foods may be contributing to ‘orthorexia’ – an eating disorder characterised by the obsession with eating foods deemed healthy. Maintaining a gluten free diet is difficult and often costs more financially than eating it. But is there enough evidence for us to say that gluten isn’t ‘clean’ and that we should reduce our intake or even cut it out entirely? Gluten is a combination of proteins found in wheat, the most common cereal grain worldwide. Barley and rye also contain gluten. In Latin, gluten means glue, which gives you a hint at its function. It’s critical for making dough rise, by forming cross-links that create a submicroscopic protein network. This contributes to the strength and elasticity of dough and when yeast is added to a bread mixture, CO2 is produced which is trapped by the gluten network and thus causes the rise in the dough. 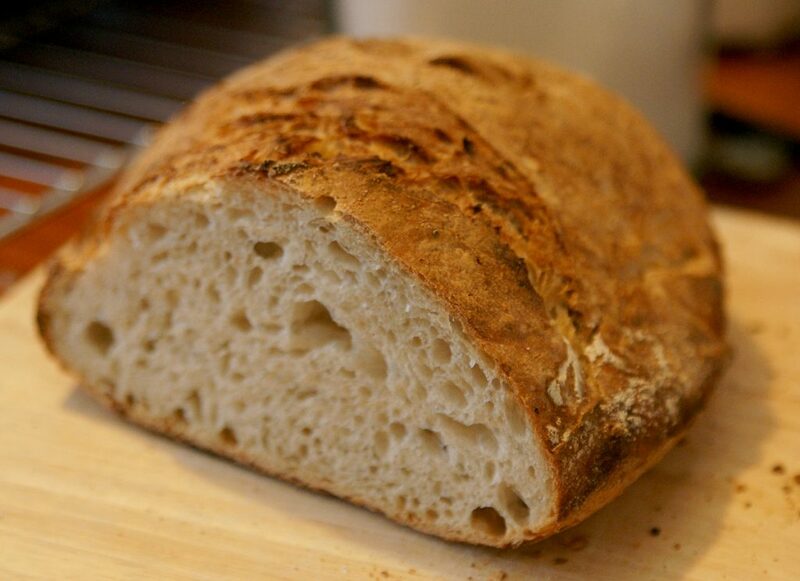 Gluten is a crucial component of bread and brings elasticity to the dough. Celiac disease is caused by an abnormal immune response to the proteins in gluten. On ingestion of gluten, celiac disease sufferers experience inflammation of the small intestine, which can negatively affect nutrient absorption. Classical symptoms include abdominal pain, loss of appetite and diarrhoea. If it is left untreated it can have some pretty serious consequences, including infertility and osteoporosis. Celiac disease is not just a gastrointestinal disease, as it may affect other organs. 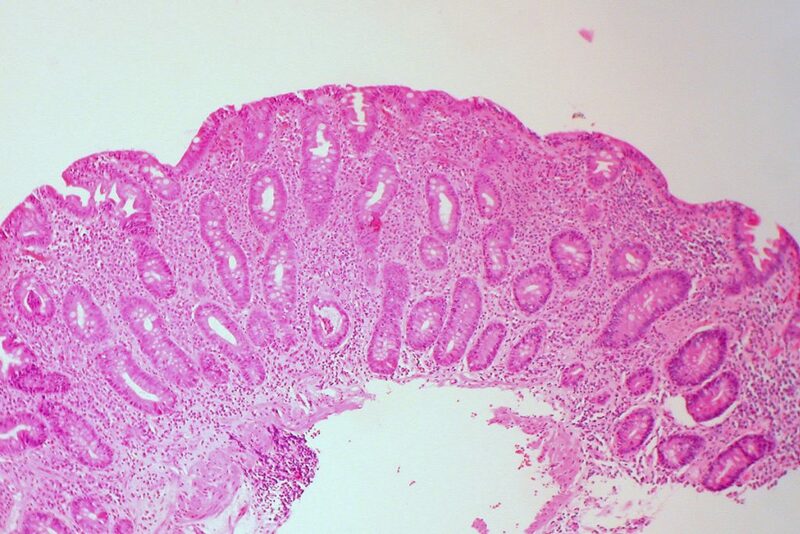 In patients with celiac disease, gluten irritates the lining of the small intestine. There is currently no treatment for celiac disease, except avoiding gluten products full stop. It’s becoming increasingly easier for celiacs to avoid gluten as many supermarkets and restaurants now cater for gluten free diets. This may be due to the fourfold increase in people being diagnosed with celiac disease, which has resulted from the development of a more simple blood test as a diagnostic tool. There is also a genetic component to the disease, which can also aid diagnosis. So if you don’t suffer from celiac disease, or are sensitive to wheat then why cut out gluten? The gluten free fad arguably may have stemmed from the work of various advocates including cardiologist William Davis and author of ‘Wheat Belly’ who labels wheat as a ‘chronic poison’. This is quite a strong claim, yet there is no evidence that those on a gluten free diet have decreased mortality than those who eat gluten. It is estimated that humans have been eating wheat for around 10,000 years and it is claimed that this is not long enough for humans to adapt to digest gluten properly. Davis argues that grains we eat today have been so altered that they are doing more harm than good. He is partially correct, the advent of GMO technology and the ‘Green Revolution’ has dramatically increased wheat productivity and different wheat are bred for disease-resistant traits, among others. However, this is not changing the gluten, we are only changing how wheat itself is produced. What I find most strange is that, as a scientist, Davis fails to look at the facts. Science is based on evidence, yet his claims are not. Admittedly, lack of evidence doesn’t mean lack of effect, but currently there is no evidence to confidently say that grains do as much damage as he is claiming. Other advocates of the gluten free diet claim that gluten causes a ‘leaky gut’, causing all sorts of ‘nasty substances’ to enter our bloodstream. In this way, gluten is a toxin and contributes to a wide array of problems. The most surprising of these neurological problems, such as dementia and schizophrenia. Supposedly, the ‘leaky gut’ induced by gluten causes translocation of gut bacteria into the body’s systemic circulation and crosses the blood brain barrier. There, bacteria and toxins disrupt neurotransmission. There is no sound scientific evidence of this, yet advocates of a gluten free diet are incredibly passionate about cutting out this ‘biologically inappropriate food source’. What is more, gluten is essentially glue, so therefore should not be eaten. It is also argued that gluten preferentially encourages the growth of pathogenic bacteria in the gut, pathogens which then enter the blood stream through a leaky gut. Reduction in gluten is often associated with the misconception that it will help you lose weight. It is not the presence of gluten per se that contributes to weight gain, but the unhealthy foods that so happen to contain gluten, such as cakes. There is no need for us to be limiting our food choices unnecessarily. The negative association we have with gluten-containing products needs to be addresses, as gluten-containing products can be beneficial to human health. Wheat is a good source of essential nutrients, including dietary fibre and B vitamins. Consumption of cereals is also associated with a reduced risk of cardiovascular disease and colo-rectal cancers. 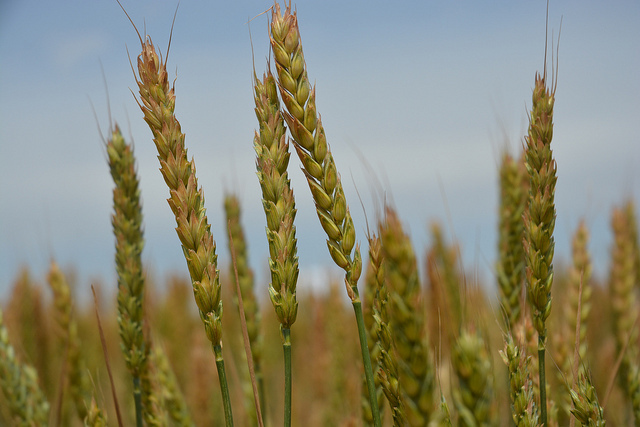 Wheat is a primary food staple throughout the world. It’s incredibly confusing being told what foods we can and can’t eat, and how much of different foods we should be eating. Eating shouldn’t be a chore, yes it is necessary, but it should be enjoyed. It is easy to let social pressures take over and redefine our notions of what ‘healthy eating’ really means. From my point of view, it’s not about cutting a food out, it’s about having everything in moderation. There’s no evidence that gluten is a toxin, so I say, have your cake, and eat it.